This particular workshop was for Rohingya refugees originally from Rakhine Province in Myanmar. Most travelled to Malaysia by boat in 2012 or 2015 to escape the troubles. 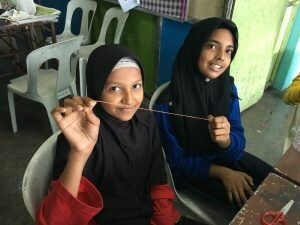 We were supported brilliantly by the UNHCR in Malaysia and the impressive teachers from the Rohingya School in Klang who gave up their weekend to support the workshop. 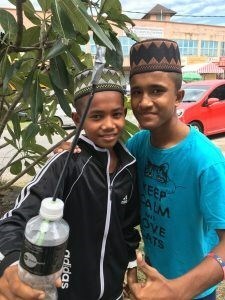 The Rohingya Schools are staffed with some amazing teachers, but the future for these children will be tough. They are only educated to primary level. They have no passports, only United Nation ID cards and hence are stateless, reliant on the goodwill of countries to stay there. 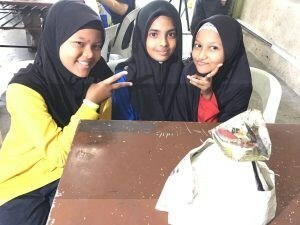 They are learning English, but none were fluent. 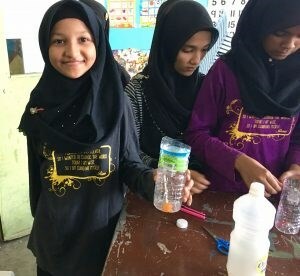 I was interested in how well they would understand the principles of scientific thinking and how creative they would be. Most of the attendees were students at the school, but It was very encouraging to see a group of lads arrive who had already left the school which stops after primary age. The only education at secondary is a religious one, studying the Koran. We started with our attitude to failure and it immediately became clear that the language barrier was going to have an impact. We are currently rewriting all the materials in a pictorial form which should reduce this. The helium straws activity showed some general gender trends. The girls tending to negotiate and discuss and the boys randomly trying tactics. Sadly the older boys opted out after a few attempts. Possibly due to not wanting to fail in front of the others. They have a potentially tough time ahead of them. They have no passports, just UN cards, no residency as they don’t have full refugee status and so are not classed as residents. They will need to be resilient and adaptable. We then did the paper towers activity using the TASC sequence. Taking them step-by-step through the segments. They were attentive and really engaged with the activities. 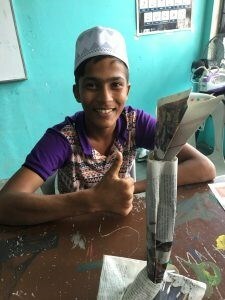 I pointed out the winner was not the one with the tallest tower, but the one who had learned the most. Whether it was this or the translation, none of them seemed to be trying to build a tall tower.There was some interesting origami going on though. I was worried that they were not going to see the point of what we were doing. These starting activities focus on Growth Mindsets and are more abstract than the core activities which have much more obviously useful outcomes. They seemed to enjoy evaluating each other’s efforts though the language barrier meant I had no idea what they were saying. Stretching the plastic bags to make a fishing line proved to be really successful despite the poor quality of the scissors on offer. Any ‘nicks’ in the strips cause weaknesses. Lines several metres long were produced and were strong enough to do a tug of war with. Fly traps showed some interesting innovations. Many of them used their plastic bag line to hang their traps up. Bait was mainly old food and the traps were placed near to a rubbish skip that was covered in flies. None of them added any water in the bottom of the trap to kill the flies. I deliberately omitted this to see if anyone would think of it. I also wanted them to fail so we could evaluate the effectiveness and update their designs. Some of the boys were seen catching flies and carefully placing them in their trap showing that performance (and winning) was more important to them than learning. The next day it was discovered that most of the traps had been removed by the rubbish collectors. The rest didn’t seem to have any flies caught with fair means. We discussed how to determine which factors were affecting the outcome. How if we changed both the bait and the position we wouldn’t know whether any improvements were down to the bait or the position. Traps were reset. Part of the lack of success was the bait was competing with large areas of rotting material, hence the flies weren’t attracted into the trap. Growing plants in bottles is a longer term activity without instant results. It was clear that few if any had grown things from seed and my crack-handed demonstration where I flooded the seeds was copied exactly. A reminder that we need to be explicit. There were some interesting innovations shown. 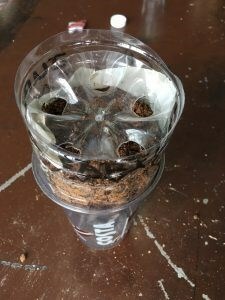 For germinating seeds the bottom of a plastic bottle was shaved off to reveal equidistant holes. Perfect for seedlings and retaining the moisture of the soil. Seedlings rather than seeds would give this activity a more immediate result which may be more engaging. We look forward to updates as the plants grow. 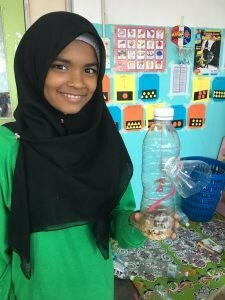 Bottle Compost is another activity that would be appropriate to support this activity. Laminating plastic bags with done with flowers was the finale. The UNHCR crew had done a fantastic job of providing the materials but it looked like getting this one to work would be difficult. The logistics of getting irons to work at the right temperature proved tricky. We had an adult with every iron and the kids ran out and got flowers to laminate between clear plastic bags. They then cut these out. It worked really well, but what was probably the most surprising was how engaged the boys were with their flowers and the great care they took cutting them out. Though here I am guilty of gender stereotyping. Conclusion This seemed to be a terrifically successful workshop. I wasn’t convinced that they had picked up the idea of Design Thinking in a scientific way from the first activities. However, watching the way many developed ideas and created innovative solutions was incredibly satisfying. A follow-up workshop is being planned if we can get some funding.